Freeze dried meat is amazing! For real. It is. 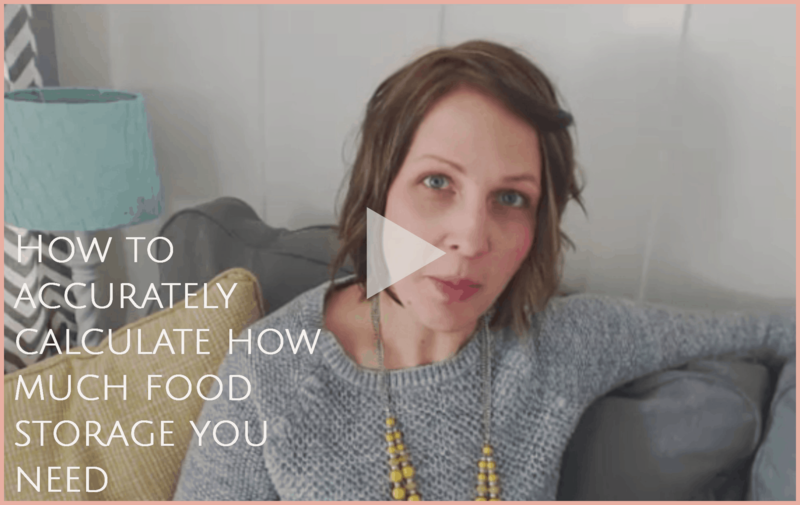 When I was growing up we stored TVP instead of meat–talk about gross! I can’t stand the stuff. Textured vegetable protein (TVP) is made from soy, and it has all sorts of additives and preservatives. It just isn’t healthy. Plus, did I mention it is gross? Yes, you can mask the flavor a bit with all those additives or you can mix it with real meat to hide the flavor a bit, but in the end, it just isn’t something I want to eat–or feed to my kids. But freeze dried meat is nothing like TVP. Note – Some links in this post are affiliate links meaning if you purchase after clicking on them, I will be given a small commission (at no additional cost to you). Learn more here about how I am (and am not) compensated, and thank you for your support of me and my family! What Makes Freeze Dried Meat So Great? Well, yes, yes it does. Because it is chicken! If you have ever frozen cooked meat and then thawed it out and eaten it, then you know what freeze dried meat is like. Freeze dried meat is cooked and then frozen. The water is then removed using a process called sublimation. This simply means that the water is removed while the meat is frozen. It goes from frozen water to steam without going through the liquid state. All that technical stuff just means that the meat isn’t changed (like it is when you dehydrate it). It is still the same size and color, and it still tastes the same. 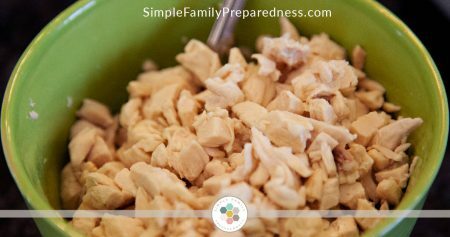 There are, however, two common mistakes that I see people make when using freeze dried meat. In fact, I made both these mistakes myself many times! Freeze dried meat is already cooked. So, if you boil it or hydrate it in really hot water, you are overcooking it. It will change the texture and make it rubbery, dry, and weird. The solution is simple: use cold or room temperature liquid instead. I use a ratio of 1:1. One cup liquid for every one cup meat. Then, let it sit for 15-20 minutes making sure you stir it every few minutes. Simple, right? When you cook with store bought meat, you typically cook it with seasonings or in broth etc. Since you don’t want to overcook your freeze dried meat, you shouldn’t do this. Instead, you hydrate it first, then add it to the dish once hydrated. But if you just hydrate it in water, this means the flavor can be a bit off–bland or dull. Making enchiladas? Use some water mixed with enchilada sauce. Making stir fry? Add some soy sauce to the water you hydrate the meat in. Making chicken noodle soup? Use bouillon and add some thyme or rosemary. 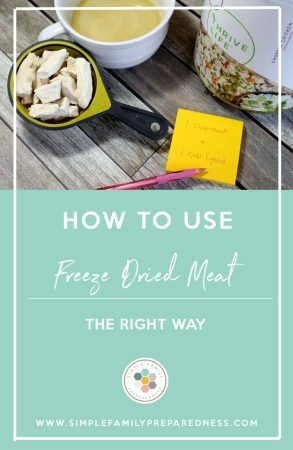 Follow these two tips and your freeze dried meats will be delicious! I occasionally pull it out just because it is so darn convenient! If I forget to thaw out meat for dinner, we use freeze dried. I love it for that reason! And that happens often enough for me to rotate through it every five years or so. Thrive Life (affiliate) is my favorite place to get freeze dried meat because it just tastes the best. They freeze dry their own (the only food storage company that currently does), and I’ve just always been happier with it. Get it for nearly 50% off by purchasing one of these “unadvertised” specials. Buy it in November (Black Friday weekend) or during their five day spring sale (typically in March or April). There are usually one-three meats at 30%-50% off. Use free/50% off product. Anytime you plan to make a $400+ purchase from Thrive Life, CONTACT ME FIRST! I’ll have you spend the $400 on anything/everything BUT meat or cheese, and then I will GIVE YOU the 50% off and free product I earn as a consultant. We will use those benefits to get your meat (and/or cheese if you want it). 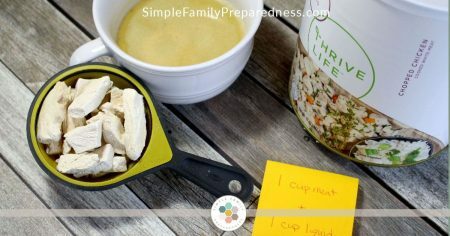 If you aren’t set on Thrive, you can also watch Emergency Essentials group buys (affiliate) each month. They occasionally have meat for fantastic prices! They also have their biggest sale in September each year, so that can be a good time as well! 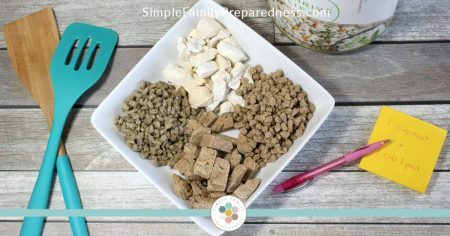 Do you store freeze dried meat? Do you use it regularly for convenience? I would LOVE to have you share this with others on Pinterest! Just click on the image below! Hi Misty. I tried to use the diced ham and so far do not like the taste. Do you have any suggestions? Are there any foods that need to be refrigerated after opening? Thanks for your great help with preparedness. The ham is actually one that should be refrigerated. It has a very high fat content and goes rancid quickly. It is one of two, turkey being the other one. I should add that to the post! on the “Thrive unadvertised special”…the meat packages were priced at $204….shipping ‘level’ cuts off at $200. If Thrive would drop the price by $4, it would save another $6 in shipping. just saying. I have no control over Thrive’s pricing Darlene (but wouldn’t that be great!?). I do know that they already subsidize shipping quite a bit…I pay 2-4x what they ask when I try to ship the same items on my own. Even with the extra $10 ($4 for the package and $6 more for hte shipping), it is still the best price on freeze dried meat around! Thanks for all your knowledge of home storing and teaching us. I am having trouble understanding the following. Anytime you plan to make a $400+ purchase from Thrive Life, CONTACT ME FIRST! I’ll have you spend the $400 on anything/everything BUT meat or cheese, and then I will GIVE YOU the 50% off and free product I earn as a consultant. We will use those benefits to get your meat (and/or cheese if you want it). Hi Tammy! Great question! Thrive Life is sold by consultants through home parties. But since I don’t do home parties and just recommend it online, I am both the host (I earn free product) AND the consultant (I earn commission). For those placing larger orders ($400+), I am happy to place the order FOR them using my consultant account and make THEM the host so that they can claim the free and discounted product I would have earned. For example, if you place a $400 order exactly, you would get and additional $40 in free product (at retail price) AND another $100 in product (at retail price) for $50. So, you’d pay $450, but get $540 in product. The benefits increase from there depending on how large your order is. But you can’t do this on your own. I have to set it up. So, you have to contact me first. Does that help?